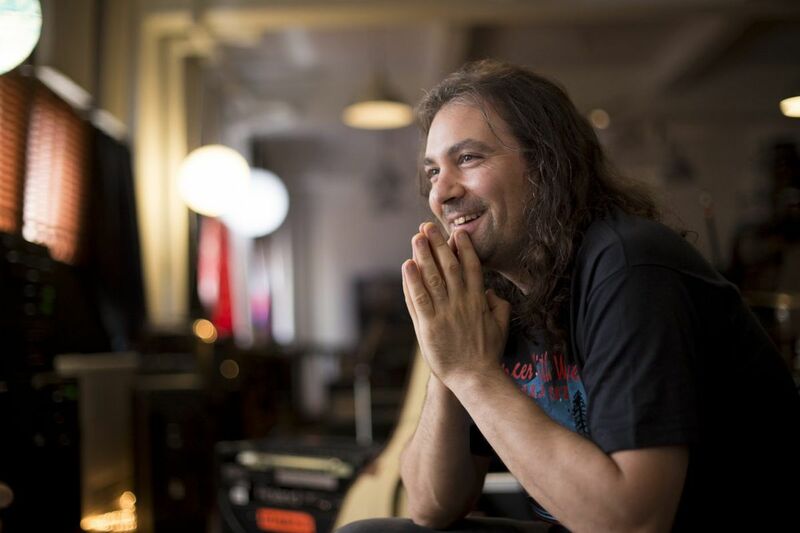 The War On Drugs’ Adam Granduciel in the band’s South Philadelphia rehearsal space. The band’s ‘A Deeper Understanding’ is one of the best albums of the year. Confront the tumult of the times, or seek a sanctuary from it? That was the challenge presented to pop music makers — and listeners — in a year in which getting as far away from the news as possible seemed like a great idea. The artists gathered on this best albums list couldn't always succeed in making the world go away and instead often engaged with a divided America in noble efforts to create artful sounds to rise above the din. Another thing about this list: Three of 10 entries are occupied by Philadelphia acts. I've also compiled a Top 10 of 215 talent, but that one wasn't long enough to do justice to the burgeoning scene, which features so many exemplary players it's hard to keep track. This year, a Philly against the world competition doesn't seem like such an unfair fight. After years of free fall, 2017 continued an upward trend in music industry revenue due to the growth in popularity of streaming services. At midyear, the numbers were up 17 percent over 2016. Meanwhile, Taylor Swift, whose Reputation moved 1.2 million copies in its first week of release, seems to be the only one actually selling albums. Speaking of Swift, the Wyomissing, Pa., native is on the cover of Time's Silence Breakers Person of the Year issue after she testified in court that a Denver radio DJ groped her in 2013. In an industry where sexual misconduct has run amok since the early days of rock and roll, if not since the beginning of time, the music world in 2017 has yet to be as fully rocked by harassment charges as might be expected, although Def Jam founder Russell Simmons and a number of indie rockers have been accused. That's likely to be a 2018 story. My favorite record of the year came from the Alabama songwriter who was a startling talent when he was with the Drive-By Truckers, and he's only gotten better in the decade since. The Nashville Sound contains the existential love song of the year in "If We Were Vampires," sung with his wife, Amanda Shires. Along with plenty of keenly observed, poetically rhymed songs informed by fatherhood, it's also a big, brawny rock record. Most important, in these fractured times, it's marked by forthright intelligence and ever-present empathy, though not so much that Isbell doesn't work himself into a rage in "White Man's World," in which he worries over his daughter's future in a divided America and seeks to remind us: "We're all carrying one burden, sharing one fate." The name of this album filled with one-word song titles works as its own single-syllable review, spoken out loud with emphasis and an exclamation point. DAMN. is the Compton rapper's affirmation of his supremacy, an explosion of verbiage that comes at the listener from all angles, breaking away from the jazz funk psychedelic density of 2015's brilliant To Pimp a Butterfly to showcase Lamar's unmatched way with words, which are delivered with dizzying energy, whether he's holding forth on "Pride," "God," "Love," or the wisdom of his parents in "Duckworth." Damn! The War on Drugs, A Deeper Understanding. The luxurious rock album of the year, by a wide margin. Conceived mostly in California, the opus by Philadelphia songwriter and guitarist Adam Granduciel fills up wide-open vistas with rich sonic detail — that is, lots of guitars, and some keyboards, too — while also looking inward to make internal inquiries. "I want to find what can't be found," he sings, always committed to the search. Amazing driving music. Am I absolutely sure this is the fourth-best album of 2017? No, but its title fates it to be so. Beyoncé's husband's credibility as an artist was on the line after the rapper-mogul was the villain on 2016 album of the year Lemonade. He needed to man-up and apologize profusely, for sure, but also to come correct musically and reestablish relevance. 4:44 does the trick, with self-analytical smarts, as he teams with producer No I.D. throughout for a cohesive sound that lays bare his thoughts on his past, personal failings, and race in America. Shredding guitarist Annie Clark made her most challenging and most pop album with this one, whose portmanteau title is pronounced "Mass Seduction." Teaming with New Jerseyan Jack Antonoff, who also produced Lorde's Melodrama and worked with Taylor Swift and Pink, Clark paints with bold primary colors on songs about compulsion and addiction. "I can't turn off what turns me on," she sings. Nor can we. Margo Price, All American Made. Price grabbed attention last year with Midwest Farmer's Daughter, in which she debuted with the honky-tonk drinking song "Hurtin' (On the Bottle)," from an album on Jack White's Third Man record label. She utilizes a full range of American roots music, includes a duet with Willie Nelson, addresses gender inequality on "Pay Gap," and on the title cut wonders whether the American Dream is a scam. Kamasi Washington, Harmony of Difference. The Los Angeles jazz man works with an expansive palette on this six-song, expertly executed celebration of diversity, which uses musical counterpoint to "Desire," "Humility," "Knowledge," "Perspective," and "Integrity" before bringing it all home on the 13-minute "Truth." Extra points because Washington's Philadelphia tour stop in November at Union Transfer was the warmest, most wonderfully human show I saw all year. Japanese Breakfast, Soft Sounds from Another Planet. The first album under the moniker Japanese Breakfast by Philadelphia songwriter Michelle Zauner was 2016's Psychopomp, which the singer wrote while reeling from the death of her mother. Grief still courses through Soft Sounds, which broadens its scope musically and thematically with sci-fi narratives and dreamy soundscapes like the inspirational opener, "Diving Woman." Orchestra Baobab, Tribute to Diouga Dieng. Senegal's Orchestra Baobab is one of Africa's greatest dance bands. Their first album of new material since 2007's Made in Dakar is named in honor of a band member who died last year. The group currently ranges in age from 27 to 74, and the Afro-Cuban grooves don't burn with the intensity they once did. That's all to the good: this spirit-lifting, expertly played album is my favorite nerve-calming music of the year. I'm cheating by including both of these albums by Philadelphia sisters Katie Crutchfield — who is Waxahatchee — and her identical twin, Allison. This list goes up to 11, Nigel Tufnel of Spinal Tap might say. My reasoning is: Waxahatchee's Out in the Storm is a bracing, direct breakup album that has landed on lots of best-of lists. Her sister's smart, poppy Tourist (also a breakup album) came out in January and isn't getting the year-end attention it deserves. Honorable Mentions: Big Thief, Capacity; SZA, Ctrl; Robert Plant, Carry Fire, Laura Marling, Semper Femina; Justin Townes Earle, Kids in the Street; LCD Soundsystem, American Dream; Lee Ann Womack, The Lonely, the Lonesome & the Gone; Rhiannon Giddens, Freedom Highway; Chris Stapleton, From a Room, Vol. 1; Father John Misty, Pure Comedy; Randy Newman, Dark Matter.